Sports Minster Caral Ni Chuilin has told the Irish FA it could face funding cuts if it fails to fully develop the women's game in Northern Ireland. 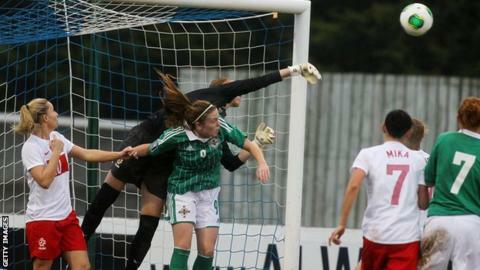 The minister believes the IFA does not promote the NI women's team on an equal basis with the men's side. "If I get a sense that women are being left behind, I will use the power of my funding to make a difference," she told the Belfast Telegraph. "I've asked the IFA to ensure women are not considered as an afterthought." The minster said there was "still much to be done in various areas and women's soccer is one of them". She added: "The money that the IFA are receiving to develop Windsor Park isn't just for the new stadium. "It also relates to community benefits and supporting developmental squads within their sport and by that I mean all squads. "When the next round of funding comes along, I will be scrutinising it to such an extent that if I don't see enough in what the IFA are doing for girls and women's soccer we are going to be having some serious conversations. "I don't want to have to force people to do it. They should be doing it because it is the right thing to do."